Ramada Hotel and Conference Center has it all. 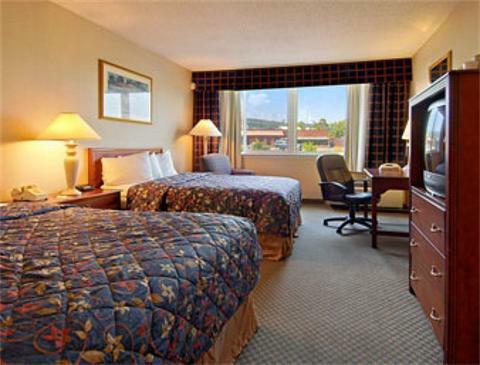 The Ramada Cortland, NY is located in the Central NY Finger Lakes Wine Region off of I-81. Minutes from downtown and close to SUNY Cortland, 3 ski resorts, golf, Cornell University, Ithaca and Syracuse. Choose from a selection of 146 newly renovated guestrooms, including rooms with two double beds, business or leisure king room. Jacuzzi suit and pool side rooms are also available. Whether it is business or pleasure or perhaps that very special event, utilize our banquet facilities. Our beautiful and specious ballroom with outdoor count yard is perfect setting. Our friendly and professional staffs will assist in every detail to ensure your event is a successful one.